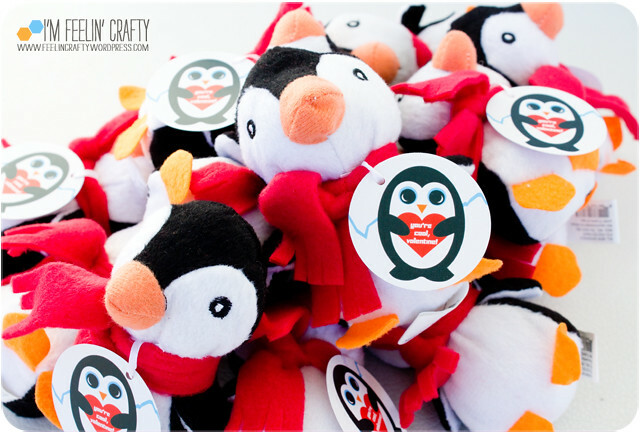 Who loves penguins??? We do! Who loves stuffies? We do! I like to make class Valentines about something the kiddo is excited about and not just about candy! Once we did Astro-Ordinary crayons. And another year we did Legos. We also did Pokémon Valentines, but I lost the pictures of those… I need to find them… Anyway… Back to the penguins! 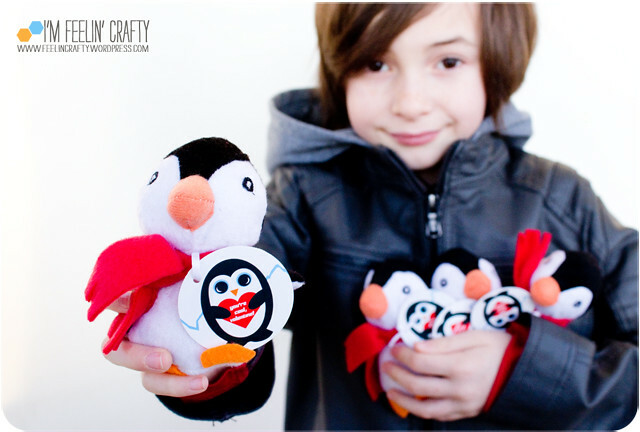 We didn’t want to do a penguin with a heart sewn on it or glued on it. 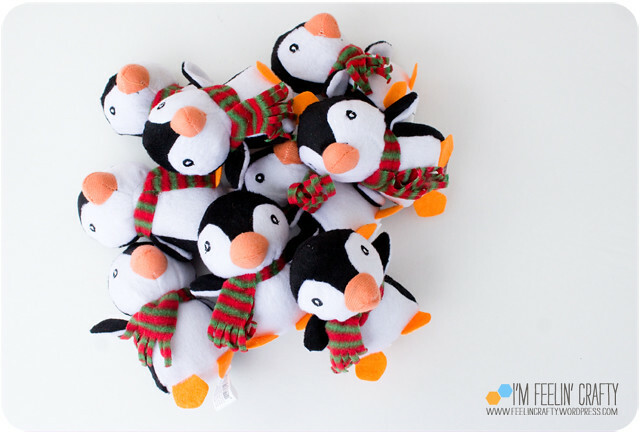 And we wanted him standing up, so we finally narrowed it down to a Christmas penguin. We ordered these little guys online. But of course, their scarfs would not do for Valentine’s Day. Nope! So we took them off. They were sewn on, but only with one stitch or so. Easy to get off. We used the Christmas scarf as our template for the red Valentine’s Day scarfs. And I designed the tags. You’ve probably seen my Quilt Design a Day ‘sketches’. To make those I use an app called Assembly, so I thought it would be fun to try to design the Valentine tag in the app as well. And we loved the way it turned out! Then came the assembly line. 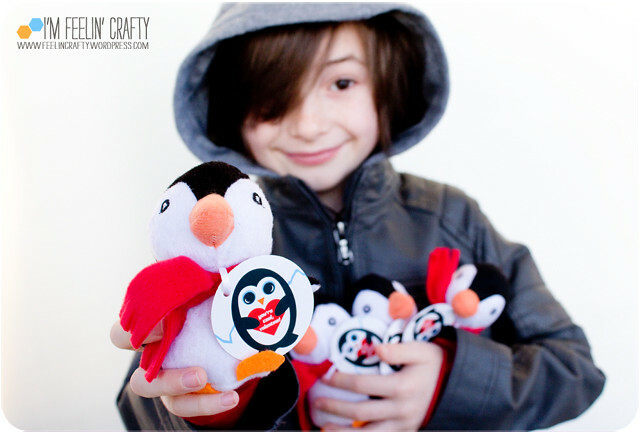 We actually added a tiny ribbon to the tag, slipped the scarf through it and then double knotted the scarf on the penguins! Soon enough we had a ton of Valentine’s Day gifts for the whole class and some special others. 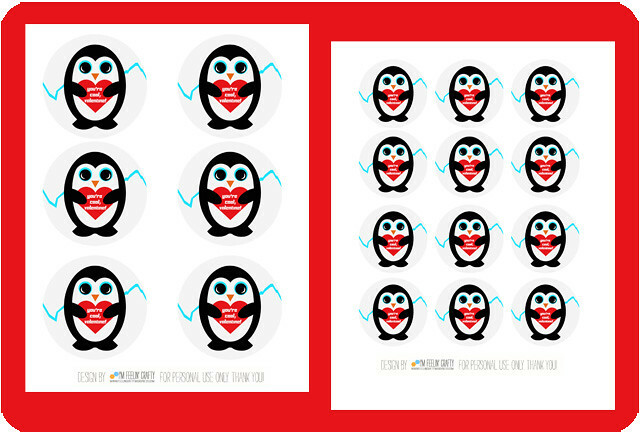 You can download the penguin Valentine tags for yourself here. I have two sizes. First I made the 3″ tags (9 to a page) and then realized it was just too big. So then I made a 2″ tag (12 to a page) and they were just right! 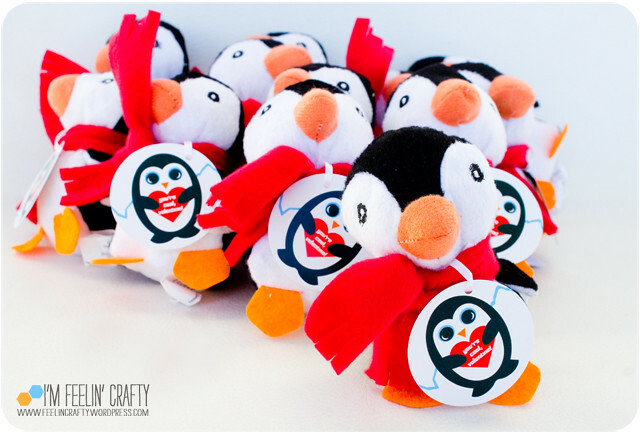 Download the 3″ Penguin Valentine’s Day Tags here. 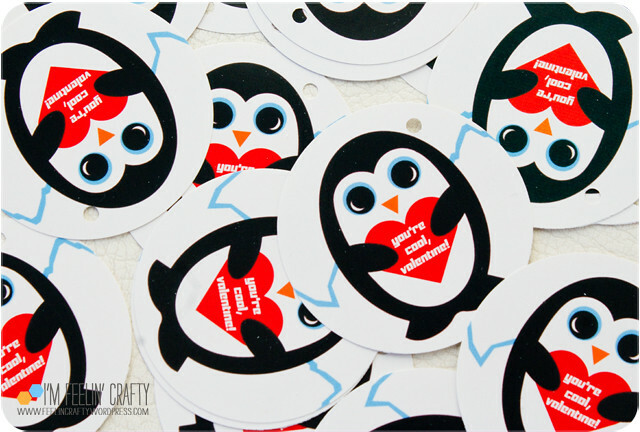 Download the 2″ Penguin Valentine’s Day Tags here. These are for personal use only! Thank you! Have you decided on your Valentine’s for this year? Goodness. You’ve hit it out of the part again! Just darling!